I’m sometimes asked why Earthworm Watch asks you to repeat the survey twice in different habitats. This blog describes how we designed the survey to try and make our data robust as possible – to better answer questions about earthworms and soil health. When planning a scientific investigation you generally start with one or more questions you want to answer and then decide what you need to measure to answer that question. Some of the questions we want to answer with Earthworm Watch include what urban habitats earthworms prefer? and how earthworm numbers relate soil carbon? There are usually lots of other variables that can influence our results so we need to either control for these or measure them as well as we can. Citizen science projects can be particularly difficult to control as people collect data in different places, times and weather conditions but we can control for some things, for example asking everyone to dig the same size soil pit. Other variables we can measure - for example we already know that earthworms are sensitive to moisture levels and soil texture so we ask participants to record those. When we analyse the Earthworm Watch data these measured variables are called fixed factors. However, there are also lots of variables that can influence our survey which we cannot control or measure, or in some cases even know what they are! (‘unknown unknowns’). Using a pair of surveys helps reduce some of this noise by treating each survey and pit as a random factor in our analysis and hopefully results in a clearer answer to our questions. Analysis is still ongoing but early results suggest that by using pairs of surveys Earthworm Watch has removed 45% of variation caused by different participants – so we can be more confident that our results are due to environmental differences. Part of this noise is because some people are better at identifying earthworms that others - here are some tips to help you identify your earthworms to ecotypes. Washing the earthworms with a little clean water is useful to see their features better. Are generally large (more than 15cm long) and can be quite stout too – as thick as a pencil sometimes. They are reddish brown in colour. If you are not sure if your earthworm is deep-living or surface-feeding check each end – the head is nearly always dark and the tail paler. These are less than 15cm long and reddish-brown in colour, and unlike deep-living earthworms usually a similar colour along the whole body. Some soil-feeding earthworms can be as long as deep-living earthworms but most are smaller. They are always paler in colour than both the other two groups, mostly pink but sometimes green or with a blue tinge. If you are not sure, look at the head end which should be pink rather than red like the other groups. There is still time to take part in Earthworm Watch before hot dry weather forces earthworms deeper into the soil. If you have received your survey pack, but have yet to dig for earthworms and submit your records, please complete it soon. 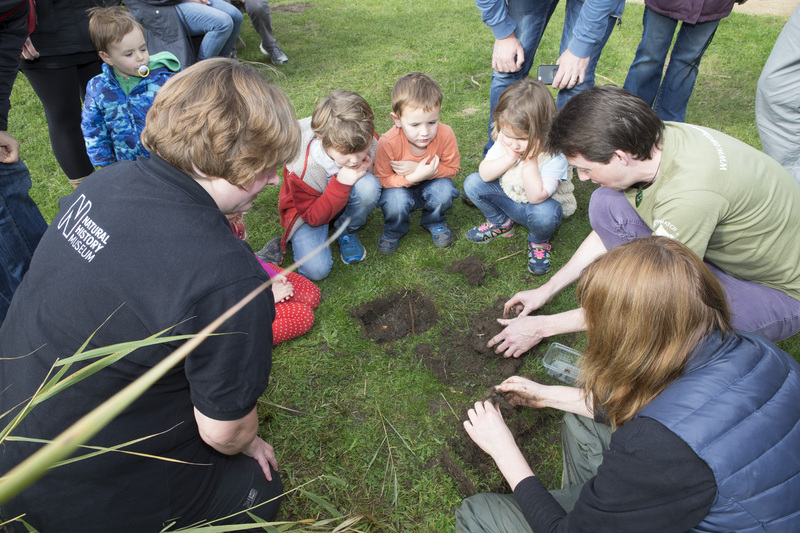 Earthworm Watch has been developed by Earthwatch (Europe), The Natural History Museum and the Earthworm Society of Britain to better understand the ecosystem benefits of earthworms. Earthworms recycle decaying organic material to improve soil fertility, they aerate the soil to create space for air and water through their burrowing actions which can prevent flooding and store carbon in fragments in the soil. Earthworm Watch allows the public to help scientists map their abundance, better understand the human impact on their populations and with further research measure the services these ‘ecosystem engineers’ provide. If you want to get involved, then sign up here. If you haven’t submitted your data, then please submit data here.